Reading Bill Bryson is like watching QI; it’s enjoyable and always leaves me feeling that little bit smarter than before. 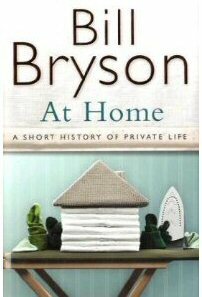 In At Home: A Short History of Private Life, Bryson tackles the subject of domesticity through the ages. He points out that history tends to focus on famous figures, politics, royalty and battles, while the vast majority of history is actually made up of everyday life. Structured on a walk through Bryson’s own home – an old parsonage in Norfolk – the book explores everything from food and fashion, to toilet habits and technology, via the development of anaesthesia and plagues of locusts. Bryson’s thorough research and genius for interesting trivia, coupled with his light touch and gentle humour make this gallop through domestic history engaging and readable. * Before dining rooms became fashionable, meals were served on a board laid across the lap.